The early history of the regiment was a complex one. The 21st Middlesex Rifle Volunteer Corps were formed in 1861. They became the 12th in 1880. The 50th Middlesex Rifle Volunteer Corps was raised in 1875. They became the 25th in 1880. Both became volunteer battalions of the King’s Royal Rifle Corps in 1881. In 1892 both battalions amalgamated as the 12th Middlesex Rifle Volunteer Corps. In 1908 they became the 15th (County of London) Bn. The London Regiment (Civil Service Rifles). One of their best known volunteers during the First World War was the sculptor, Henry Moore. He and his regiment took part in the battle of Cambrai, where he was gassed. He was sent back to recover, and later returned to France, but by then the war was over. 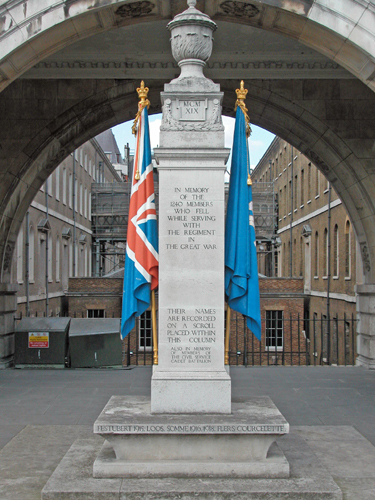 The war memorial was designed by Sir Edwin Lutyens and erected in the central courtyard at Somerset House in 1924. It is in the form of a column surmounted by an urn, with the Union flag on one side, and the standard of the Civil Service Rifles on the other. I was commissioned to carry out an analysis of the paint in order to ensure that the correct colours were used in the repainting. I found that the war memorial had been painted on ten occasions, and has been treated in a very similar fashion throughout its existence. With the exception of one small detail, the disposition of colour is as it was originally. Those elements that are now painted with bronze paint were gilded until recently. The exception referred to is that the shaft and barbs of the Prince of Wales’s feathers were originally gilded and not black as they were when sampled. The white elements saw a very early use of the newly developed pigment known as titanium white. This is one of the earliest uses of this pigment so far encountered in this country.